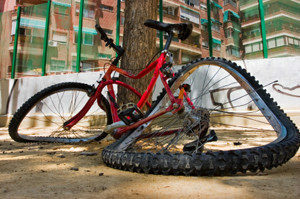 Injured In A Cycling Crash? Illinois personal injury attorneys offer info on insurance claims and legal assistance for free to injured cyclists regarding a car wreck. if the accident was severe, call 911 and GET MEDICAL ATTENTION. DO NOT DECLINE MEDICAL ATTENTION. This is important for a variety of reasons, but most importantly because internal injuries do not always show how critical they are right after an accident. gather as much information as you can from the scene. You will want the name, contact, and insurance information of the driver. Also note the make, model, and license place of their car, note the location of the accident, traffic conditions, road work, and the weather. Also, take photos and talk to witnesses if able. Be sure to get the witnesses’ information as well. DO NOT FIX YOUR BIKE. It needs to stay in the condition it is in so that it can serve as evidence. Keep any other physical evidence, such as clothing, gear and a helmet, if worn. Also, note all of the crucial details regarding what happened, when, with who, and how it came to be.